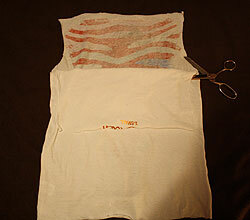 This really easy modification is a great way to give unused and unloved t-shirts a new lease of life. I used to buy t-shirts at gigs then really regret it. I never like the designs they have in women’s sizes as there’s usualy fewer to pick from and they’re never as nice as the men’s. So I’d buy a male one (without trying it on) then regret it when I got home, looked in the mirror and realised it made me look like a shoebox. Even with my limited sewing experience this still turns out really well for me. The t shirt I used was just awful quality, this made it a nightmare to stitch but also it doesn’t sit as well as a better one would have, so this pattern is even more effective if you’re using a better t-shirt (I paid €1 for this one). 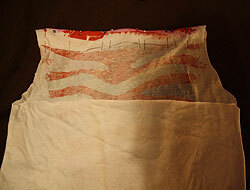 Iron the t-shirt then lay it flat and match up the seams front and back. This means after you cut it it will be an even length all around. Cut away the sleeves and the bottom hem. Keep the bottom hem in one piece as this can be used later on as the drawstring. 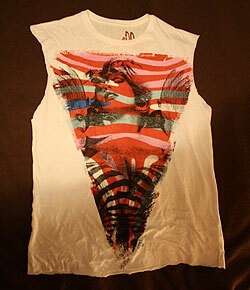 Cut away the top bit of the t-shirt from below the neckline. Be sure to preserve as much of the design as possible. 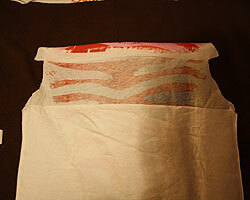 Flip the t-shirt over and cut away the top part of the back of the t-shirt only from the bottom of where the sleeves used to be. 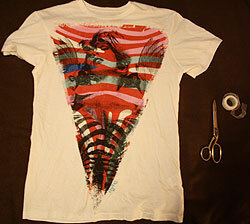 Fold the top part of the front of the t-shirt inward leaving enough space for the seam and drawstring. Trim away any bits of fabric that may be jutting out at the side. Pin along the top then sew along the line. After this the drawstring can be fed through the seam at the top. To do this I used a long hair stick (like a pointy chopstick). I put it through the point through the middle of the drawstring and pushed it through. Alternatively you can feed some thread or a piece of string through, tie the end to a safety pin and pin it to the drawstring and pull it through. Enjoy your new halter neck. In this case our dress mannequin Agnes is enjoying it for me. 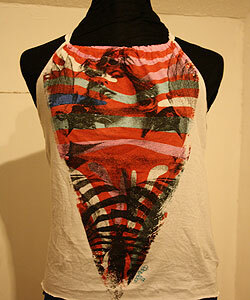 This entry was posted in Fashion, Modifications and tagged cutting, Fashion, gig, halterneck, modification, sewing, t-shirt, t-shirt cutting. Bookmark the permalink. how are you!This was a really excellent theme!